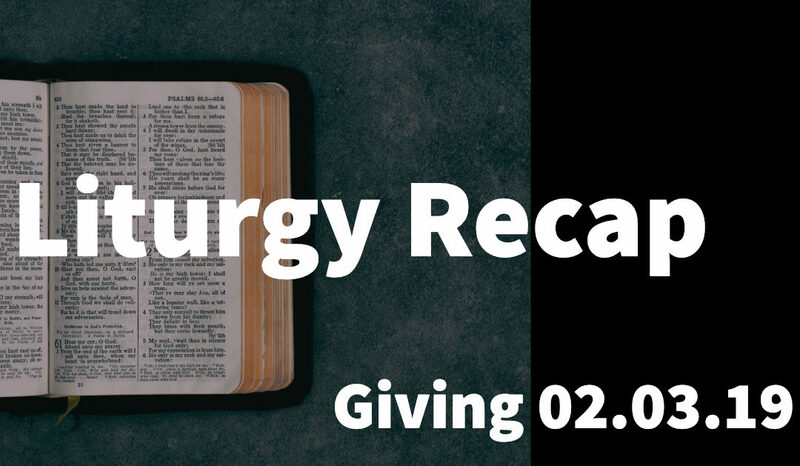 This Sunday we took time before our offering to focus in on why we give. Our God is a generous God and He calls us to be generous as His people, but so often we lose sight of why it is we give and what that means for the Kingdom. Brooke Seager led us in a responsive reading from the book “Every Moment Holy” by Douglas McKelvey. The bold portions below are what we read together as a church family. In truth, I have nothing but you, O Christ, nothing that I might call my own. So let that good confession now compel a better stewardship. First teach me to treasure you, Jesus, above all things. Then let that increasing devotion be increasingly demonstrated in a joyful generosity – for to give is to live out the declaration that you alone are my provision and supply. I need not fear what comes tomorrow. When I give to meet the needs of others, when I give to the work of those who serve the poor, the sick, the oppressed, when I give to the service of your Body and your Kingdom, I give not what is mine, but only what is already yours. With every charitable act I am simply practicing the fact that nothing which passes through my hands has ever belonged to me. You are my generous master. Make me your faithful trustee, teaching me to live as a wiser conduit of this general grace, learning to hold loosely the things of this world, never hoarding that which is yours, never seeking the mean preservation of my own comforts. Rather let me love well in my giving, even as you, O Father, have loved me so well by giving me all things in Christ.